We started the day by widening the driveway. Michael Shortt’s father delivered a truckload of gravel and Michael’s son and his Bobcat created more parking places. Gretchen says that our front yard is now a giant turnaround. She may be right because we find that country living means having room for all of our contractors to park at once plus leaving enough parking space for our friends to drop in and see what we are doing. The UPS truck driver has to fend for himself. 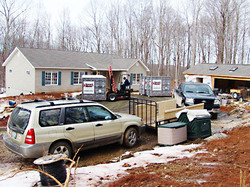 The driveway widening was necessitated by the impending arrival of the five Smart Vaults with most of the St Lawrence household goods in them. The storage vault approach to moving has a lot to recommend it when your house is still full of contractor tools and every square foot of floor is covered with thick gobbets of drying clay and gravel from the driveway. Your household goods are safely protected until your house is really ready for furniture. Our five Smart Vaults were delivered on time and unloaded in less than an hour by Ivy Harvell, a UPS/Overnite employee from the Charlotte, NC terminal. Ivy placed the vaults exactly where I wanted them on our newly created driveway parking spaces. He was a pleasure to work with. The whole Smart Move experience was so effortless that I would recommend it to anyone who needs temporary storage on the sending or receiving end of their move. The only disappointment was the inability to track the Smart vaults as advertised. The customer service rep who had been so helpful in setting up the move completely dropped the ball when it came to arranging for me to track the smart vaults with the built-in GPS tracking system. She said tracking involved some sort of a setup by a technician and she was going to send me an email wih the necessary codes and passwords. It never happened. I would guess that this free service is not actually debugged yet because it should not require a technician to activate tracking. Bottom line: Smart Move offers a convenient containerized shipping system at a firm price for the homeowner. It is a total and welcome change from the traditional moving experience. Just don’t expect to track your shipment online yet. By means of a very intense phone conversation with the Blue Ridge Heating and Air installation team, I managed to convert a January 3 date for completion of our stove installation to an early morning arrival today. They arrived and set to work and eventually discovered they had not brought the necessary parts, so one member of the team was dispatched to the nearest store which was 20 miles away. The remaining installer did a creditable job of installing the roof-mounted kit for the wood stove and we finally thought we had a working wood stove. I started a fire, which drew very well, but the blower didn’t work. I was assured by this "experienced" installation team that the blower would come on when the stove got hot enough (109 degrees F). I was gullible enough to believe them. The team then finished the installation of the pellet stove, which had been smoking ever since it was first installed several weeks ago. They packed up their tools and presented us with a final bill which included $900 of installation labor that the salesman had failed to mention or itemize. We had paid in advance for these stoves and had taken great care to ask was everything included in our invoice. We had been assured by Bob Martin that everything was included. It was not. We made out a check for the balance of the invoice, including $900 of unanticipated expense and bid our installers goodbye. A half hour later I verified that the house wood stove was hot enough to burn the hand and yet the blower would not come on. I called our installers and gave them the choice of returning to the scene of the crime now or tomorrow morning. They wisely decided to came back and arrived within the hour. After giving me all sorts of explanations why the blower wasn’t supposed to run, I told them to short out the thermostat so I could control the blower no matter how hot or cold the stove was. It took them another fifteen minutes before they managed to replace the faulty thermostat with a jumper. After that the blower worked as I wanted it to. We ran both stoves for the rest of the day. The wood stove in the house is an excellent source of heat. The blower produces a high volume of warm air which raised the temperature of the entire house in a relatively short time. When we install the overhead fans, we should have no problem distributing the heat evenly. The pellet stove is still producing an unacceptable amount of smoke inside the workshop. It appears that the stovepipe is still leaking. I read the installation instructions again and will contact the factory for an alternate stovepipe configuration. I will contract with another firm to install the new stovepipe, as I do not trust Blue Ridge Heating and Air to do the job. They sell excellent brands of wood stoves. It is too bad that they know so little about the stoves that they sell. From the problems I have seen with these two installations, I feel that a customer puts themselves at risk by having this company install their stove. Other customers may have different experiences entirely. Let the buyer beware. The pace is picking up. Tomorrow, a trench will be dug between house and workshop to house water pipes, electrical cables and CAT 5 cables for DSL and telephone. We will finish piling up the cord of firewood delivered yesterday and dumped where the trench is to go tomorrow. I will probably devote a few words to the problems we encounter with the local clay. You may have some suggestions for dealing with this stuff. David, It has been a pleasure to read your posts. Your advice on career were good ones. It seems that the corporate world had gone further and further away from you. The wounds have healed (which is good). Now that you are busy with your new life you shouldn’t look back. Others will assume the role of writing about work life. As for you it is in the past. I still have many years to work for corporate world, so I will now seek advice in other blogs. Your blog should now seek new audiences. That’s life, we move on. I will read other blogs, You will write on other subjects. Glad to see Smartmove brought your containers on time. They just told us that ours are still on the wrong side of the country, and won’t be here as scheduled — a massive pain in the a**, when you have paid a permit to block off the street, etc. — but this should be no surprise, since they were days late to drop the containers off and pick them up. FWIW, the problem may be with the local contractor or affiliate, though that’s hardly much consolation. The folks in Denver don’t seem to know what’s going on, make promises they don’t keep (“tomorrow”), do not call you back, and are impossible to reach by telephone. Truly a nightmare. That sounds like the downside to outsourcing their pickup and delivery service to UPS/Overnite. Our experiences with UPS/Overnite were exceptionally good. It sounds like their service is not uniformly good across the country. Nonetheless, the customer support people at Smart Move in Denver should have been on top of the problem. Come to think of it, we have not heard from them recently either, not since the woman I dealt with went on vacation! I will do some digging and see if I should revise my recommendation. My fire comes out and is replaced next week! !